When this article was published in 1952, the transistor was not quite five years old, and the first commercially available transistor had been on the market for a year. Germanium was the semiconductor of choice at the time since silicon had not been refined enough yet. The term 'point contact' refers to the manner in which early transistors were built where the emitter and collector connections with the base material were metal pieces pressed against a doped germanium slab. The obvious mechanical weaknesses (temperature coefficient of expansion, vibration, interface contamination, etc.) were shortly mitigated by deposition of metal directly onto the semiconductor substrate. Author Slade offers one of the electronics industry's first hobby/professional magazine articles explaining the physics of a semiconductor. 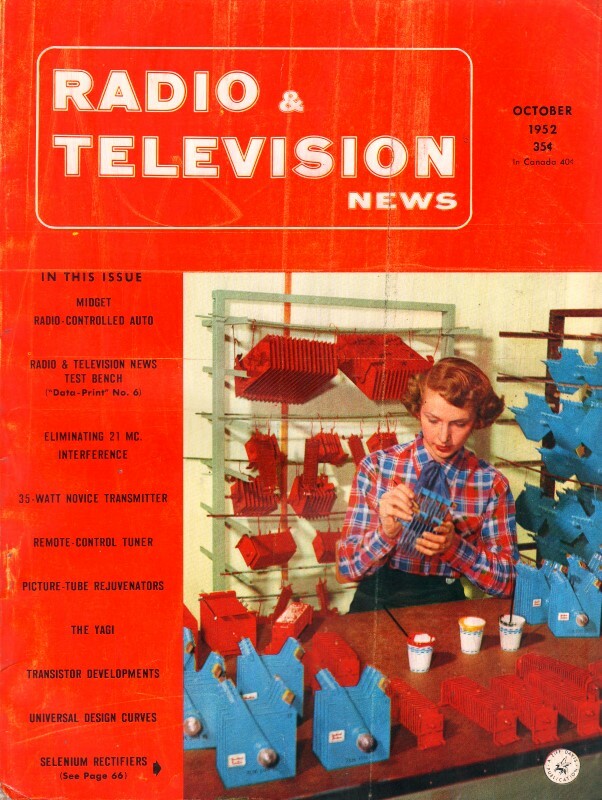 Unfortunately, I do not yet have the issue of Radio & Television News that ran Part 1. Part 2. A resume of point-contact characteristics, its frequency response, and power considerations. Fig. 1. RCA's developmental "p-n-p" junction transistor shown with and without the plastic covering. In the first article of this series the preparation of germanium crystals, the conductivity of germanium, the fabrication of the point-contact transistor, point-contact rectification, and the operation of the point-contact transistor were covered. This article will consider the characteristics of a point-contact transistor, transistor frequency response, and power considerations of this unit. The electrical characteristics of the point-contact transistor may be described by static characteristic curves having slopes equal to the open-circuit resistances. For example, the input characteristic, illustrated by the curves in Fig. 2, is defined as the emitter voltage vs the emitter current for several values of constant collector current. The slope of the curve taken at any point is defined as the open-circuit input resistance because the output circuit is an open circuit for a.c. currents. The feedback characteristic is illustrated in Fig. 3. The slope of this curve is the internal feedback resistance which is mutual to both input and output circuits. 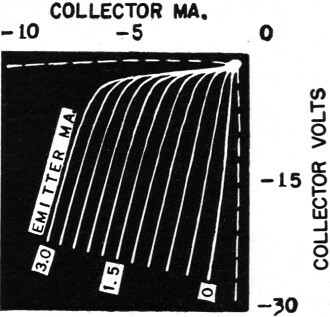 This resistance is a measure of the effect of collector current upon the voltage drop at the emitter point. It acts as a positive feedback element, and, if it becomes too large, the transistor may become unstable. Fig. 2. Input characteristic of the RCA developmental point-contact transistor. Fig. 3. Feedback characteristic of the RCA developmental point-contact unit. The output characteristic curve is given in Fig. 5. The slope of this curve is the open-circuit output resistance. This resistance is approximately equal to the collector resistance, or the a.c. impedance which exists at the collector contact. The current amplification factor which is a measure of the effect of the emitter current upon the collector current, may also be measured from the output characteristic. Along a line of constant collector voltage, a change in collector current for an increment of emitter current may be measured. 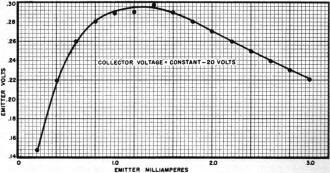 The current amplification factor is equal to the change in collector current divided by the change in emitter current. The output characteristic curve is similar to the curves of the plate family of the electron tube except that the voltages are plotted as a function of the currents for the transistor while the currents are plotted as functions of the voltages for the vacuum tube. .An oscillogram of the output characteristic of a typical point-contact transistor is shown in Fig. 4. Because a transistor may have a negative input resistance, it is possible to obtain two sets of currents for one set of voltages. 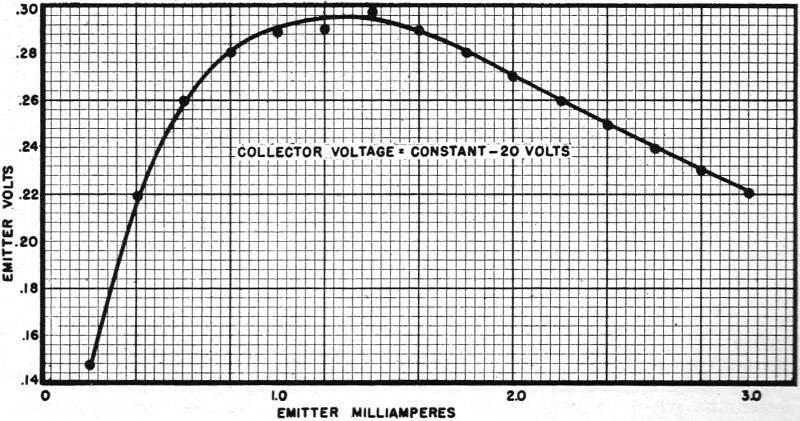 This effect is shown in the curve of emitter voltage vs emitter current for a constant collector voltage, in Fig. 7. 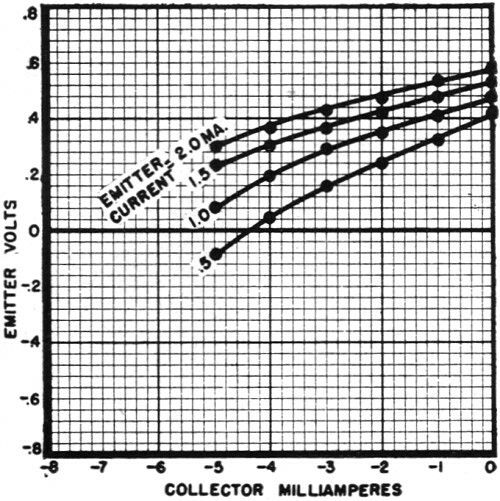 As the emitter and collector currents increase, the voltage across the internal feedback resistance becomes larger. Since this voltage is negative with respect to the base and is in series with the applied emitter voltage, a point is reached where the total emitter voltage decreases with increasing emitter current, resulting in a negative input resistance. For an emitter voltage of 0.26 volt and a collector voltage of -20 volts there are two values of emitter current which may be selected from the curve shown in Fig. 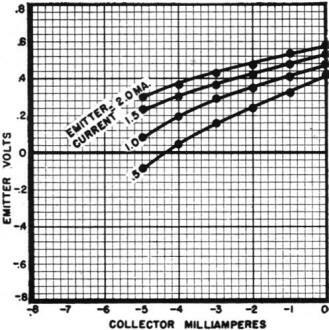 7: 0.6 milliampere and 2.2 milliamperes. 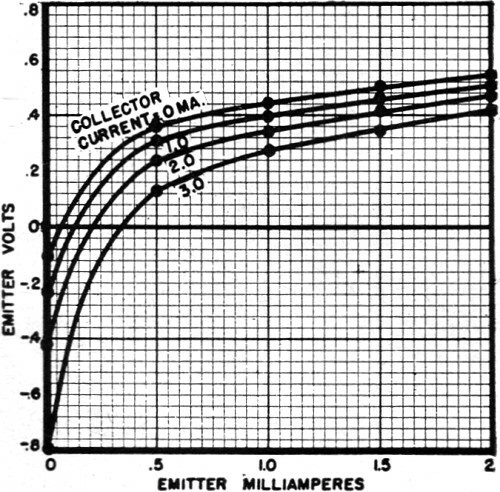 There will also be different collector currents for these values of emitter current (2.0 and 5.0 milliamperes, respectively). Because there is only one set of voltages for a given set of currents, it is desirable to plot the voltages as a function of currents. It is also highly important that constant-current rather than constant-voltage sources be used. 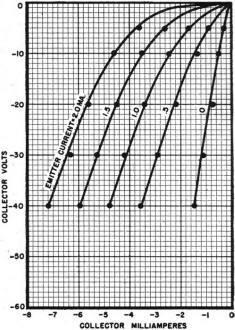 If fixed voltages were applied directly to the emitter and collector, any slight increase in collector current would tend to increase the emitter current due to the effects of feedback. This increase would, in turn, increase the collector current and considerable instability would result. In junction transistors, which will be discussed later, neither the negative input resistance nor the positive feedback exist. Therefore, constant voltage supplies may be used with no possibility of instability. The transfer resistance is defined as the slope of the transfer characteristic curve which is illustrated in Fig. 6. This resistance is also equal to the product of the current amplification factor and the output resistance. Some typical values of open-circuit resistances for a point-contact transistor are: input resistance, 300 ohms; output resistance, 20,000 ohms; feedback resistance, 120 ohms; and transfer resistance, 40,000 ohms. Because of feedback effects, the optimum input and output impedances for maximum gain in an amplifier circuit using this transistor are slightly less than the open-circuit resistance values. However, an input impedance of 200 to 500 ohms and an output load impedance of 10,000 to 20,000 ohms would result in a power gain of approximately 20 db which is close to the maximum available gain. The power gain of the transistor depends upon three major factors. First, the gain varies almost directly with the ratio of output impedance to input impedance. This ratio may be on the order of 100 to 200 to 1 in point-contact transistors; in junction transistors the ratio may be on the order of 10,000 to 1. Secondly, the power gain varies as the square of the current amplification factor, which may be on the order of 2 or 3 for point-contact transistors and slightly less than one in junction transistors. Thirdly, the positive feedback of the transistor accounts for several decibels in power gain. The amount of the gain due to feedback depends upon the magnitude of the internal feedback resistance and the current amplification. Fig. 4. Oscilloqram of output characteristics of RCA developmental transistor. The frequency response of the point-contact transistor is limited by the transit time of the holes or electrons; transit time is the time it takes the holes or electrons to travel from the emitter to the collector. The transit time in seconds may be calculated approximately through use of the expression S3/ρμIe, where S is the contact spacing or the distance between the emitter and collector in centimeters, ρ is the resistivity of the germanium in ohm-centimeters, μ is the mobility of the holes or electrons in centimeters squared per volt-second, and Ie is the emitter current in amperes. Since an improved frequency response results from a small transit time, it can be seen from this expression that the response can be improved by using germanium of high resistiv­ity and small contact spacings. The mobility of the holes or electrons is the velocity with which they move through the germanium when an electric field is applied. In the case of "n"-type germanium, holes travel from the emitter to the collector; in the case of "p"-type germanium, electrons travel from the emitter to the collector. The mobility of electrons is greater than that of holes and, consequently, the frequency response of "p"-type germanium is slightly better than that of "n"-type germanium, provided that the contact spacings and resistivities are comparable. The frequency response may be defined as the measure of the change in current amplification with increasing frequency. The current amplification factor of certain types of close-spaced point-contact transistors drops approximately 3 db. at 10 mc. A 3-db. drop in gain has been chosen to define the cut-off frequency. This method of measuring frequency response, however, defines only one parameter as a function of frequency. If the power gain of the device is measured as a function of frequency in an amplifier with a high-impedance load, the response of the transistor deteriorates more rapidly. A transistor having a 3-decibel drop in the current amplification factor at 10 megacycles may have a cut-off of voltage or power gain at 4 megacycles or less. Fig.5. Output characteristics of the RCA developmental point-contact transistor. Fig. 6. The transfer characteristic of RCA's developmental point-contact transistor. The frequency of operation of point-contact transistors decreases fairly rapidly with increased point spacings. Since the transit time of the electrons or holes increases as the point spacing increases, in theory the frequency response of the transistor varies inversely as the cube of the spacing. However, some interesting studies have been made of "n"-type transistors having wide spacings between contacts,1 and these devices appear to have some useful characteristics. If germanium having high resistivity is used, transistor power gain and current amplification are relatively independent of the separation of the points up to approximately 0.015 inch. As the spacings increase, however, the effect of the collector upon the emitter decreases, that is, the feedback resistance decreases. A transistor having a feedback resistance of 200 ohms at 0.002-inch spacing of the contacts would have only 50 ohms at 0.015-inch spacing. This value of feedback resistance for the wide-spaced transistors is low enough to assure short-circuit stability while values of power gain as high as 23 decibels are maintained. Even though the frequency-response limit varies inversely with the point spacing, the cut-off of the current amplification factor of the wide-spaced transistor is approximately 100 kilocycles because the resistivity of the germanium is higher than that used in narrow-spaced units. The other characteristics, except for the low internal feedback, are similar to those of the close-spaced transistor. The power capabilities of point-contact transistors are low and considerably limit the use of these devices. Most point-contact transistors do not withstand a collector power dissipation greater than 200 milliwatts. If the efficiency of operation as a class A amplifier is assumed to be 30 percent, only 60 milliwatts of power output may be obtained from one stage of a transistor amplifier. A conservative figure for operation would be somewhere between 30 and 40 milliwatts. There are, however, many applications in which some benefit may be obtained from a device which operates at low power dissipations. Consequently, the greatest opportunities for the use of point-contact transistors lie in those applications where power output is of relatively little importance and conservation of power is of primary importance. The power-handling capacity of the point-contact transistor is limited largely because of thermal effects at the collector point. Considerable heat is generated at this point of contact when a current is passed through it. Germanium is a fair conductor of heat and, consequently, some of the heat is conducted away from the point of contact through the germanium crystal and away from the crystal by the metal support. If too large a value of current is passed, however, the germanium and adjacent parts are unable to carry the heat away rapidly enough. 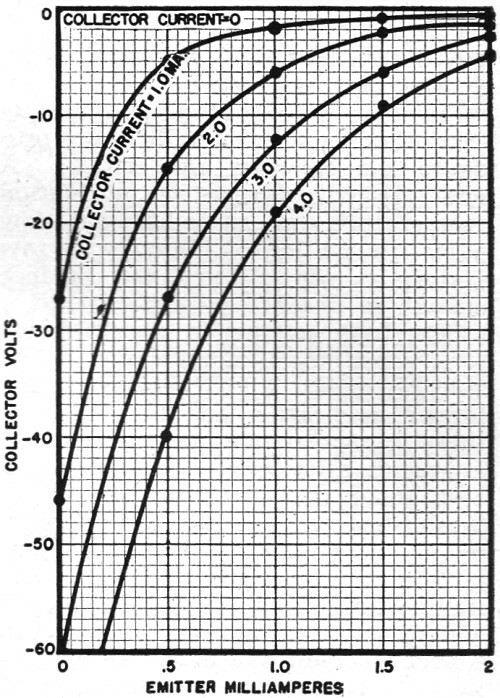 If the collector point becomes too hot, the collector resistance decreases and a change occurs in the collector bias current and also in the voltage drop across the collector. Some permanent damage may occur if the transistor is operated at too high a dissipation. It is desirable, therefore, that the mechanical construction of the transistor be designed for the best possible heat conductivity away from the crystal. By increasing the size of the crystal support and adding cooling fins, the allowable dissipation of the transistor may be increased to 500 milliwatts or more, thus increasing the power output of the transistor. The amount of conduction of heat away from the contact area varies inversely with the ambient temperature. As the ambient temperature is increased, the temperature at the point of contact becomes too great and the collector resistance is reduced. Changes in other properties of the transistor, such as the emitter resistance, transfer resistance, and internal feedback resistance, may also occur. The net result of these changes is a loss of power gain, changes in bias conditions, and possible permanent damage to the transistor. For best operation, germanium transistors should be operated at temperatures below 60 degrees centigrade. The maximum dissipation ratings of the device should also be reduced as ambient temperatures are increased above normal room temperature. At ambient temperatures below 25 degrees centigrade the situation is less critical, and if the temperature is low enough higher dissipations may be used without loss of stability. Fig. 7. Negative input-resistance characteristics of the point-contact transistor. The life of the point-contact transistor is largely dependent upon electrical and physical considerations. The most obvious requirement for long life is that the transistor be physically very rugged. The slightest shifting of the point contacts may result in large changes in transistor characteristics. The RCA developmental transistors2 which are illustrated here are embedded in a thermosetting plastic or resin. As a result of this embedding process, the transistor may be subjected to severe impacts with no damage to the physical and electrical characteristics of the transistor. Centrifugal forces with accelerations as high as 31,000g, and impact tests with accelerations as high as 1900g, have been applied to these transistors with no effect upon their characteristics, irrespective of the directions of the applied forces. Experience has indicated that one of the most important causes of slump and failure in transistor operation is the attack of moisture and other chemical agents of the atmosphere upon the point-contact area of the transistor. A transistor which is completely unprotected may fail in relatively high humidity in a few hours. It has become necessary, therefore, to prevent this moisture attack as much as possible by enclosing the point-contact area in waxes or resins having low moisture-absorption properties. Developmental RCA resin-embedded transistors have been subjected to continuous exposure at 95 per-cent relative humidity and immersion in water for periods of several months with practically no effect on transistor characteristics. Under normal conditions, transistors may be expected to survive with little change in characteristics for a long time. Predictions of point-contact transistor life of more than 70,000 hours either on the shelf or in operation do not seem at all unlikely if the transistors are operated within their ratings. The resin-embedded transistors also withstand temperatures lower than -70 degrees centigrade and higher than 100 degrees centigrade during storage with no damage. Operation at the low values of temperatures is practical, but operation at high ambient temperatures is not feasible, as was mentioned before. These developmental transistors have also been subjected to temperature cycling between -70 degrees centigrade and 100 degrees centigrade with no change in transistor electrical or physical properties resulting. If the transistor is to compete with other electron devices, uniformity and reproducibility of its characteristics are essential. The uniformity of transistors may be influenced to a large degree by the proper control of point spacing, point pressures, and the fabricating techniques employed. The uniformity of the germanium itself, however, is probably the most important factor in obtaining reproducible transistor characteristics. The art of germanium-crystal growing is rapidly progressing, and the uniformity of germanium has improved to the point where various transistor characteristics, such as current amplification, power gain, feedback resistance, and input and output resistance, have been controlled to within ±25 per-cent. Uniformity comparable to that of the electron tube seems entirely possible. Other developmental germanium-crystal devices, known as "p-n" junction transistors, have somewhat different characteristics from those of the point-contact transistor. In comparison with currently produced point-contact types, the junction transistors have lower noise, higher power gain, greater efficiency of operation, and higher power-handling capabilities. These improved characteristics, however, are not obtained without some loss in frequency response. Table 1 compares average values of several characteristics of the two types of transistors. Two types of junction transistors have been developed. The "n-p-n" junction transistor3 is composed of alternate n, p, and n layers of germanium grown from a single crystal, as illustrated in Fig. 8. The center layer of "p"-type germanium is very thin; its thickness may be as little as 0.001 inch. Low-resistance contacts to the "n"-areas form the emitter and collector, and a low-resistance connection to the "p"-layer constitutes the base terminal. The principle of operation of the junction transistor is somewhat different from that of the point-contact transistor in that the rectification takes place at the junctions between the p- and n-type layers rather than at point contacts. in the point-contact transistor, holes or electrons drift from the emitter to the collector under the influence of electric fields. In the "n-p-n" junction transistor, electrons diffuse through the p-type layer and are attracted to the collector. The center layer has an excess of holes, but if this layer is thin enough, most of the electrons entering the base region from the emitter will reach the collector region without recombining with the holes. Practically all the electrons leaving the emitter reach the collector, thus resulting in a current amplification of approximately one, but this type of transistor cannot attain current amplifications greater than one unless more complex junctions are introduced. High power gains are obtained as a result of the tremendous impedance step-up between input and output circuits. The emitter junction is biased in the forward direction, and since the forward resistance of the junction is very low, the input impedance of the device is as low as 25 to 100 ohms. The resistance of the collector junction, which is biased in the reverse direction, is very high, on the order of several megohms, thus resulting in a very high output impedance. This tremendous difference in impedances can result in power gains of over 40 decibels. Another junction device, the "p-n-p" transistor, illustrated in Fig. 1, is formed by diffusing two "p"-type impurity metals on opposite faces of a piece of "n"-type germanium. Atoms diffuse from these impurity metals into the germanium at high temperatures converting a portion of the "n"-type germanium to "p"-type, thus forming "p-n" junctions.4 In this transistor, the emitter is biased positively with respect to the base, and the collector is biased negatively with respect to the base. Hole carriers are injected by the emitter and arrive at the collector, resulting in a current amplification factor of approximately one, as in the "n-p-n" transistor. Fig. 8. Arrangement of "n" and "p" layers in an "n-p-n" type junction transistor. Fig. 9. 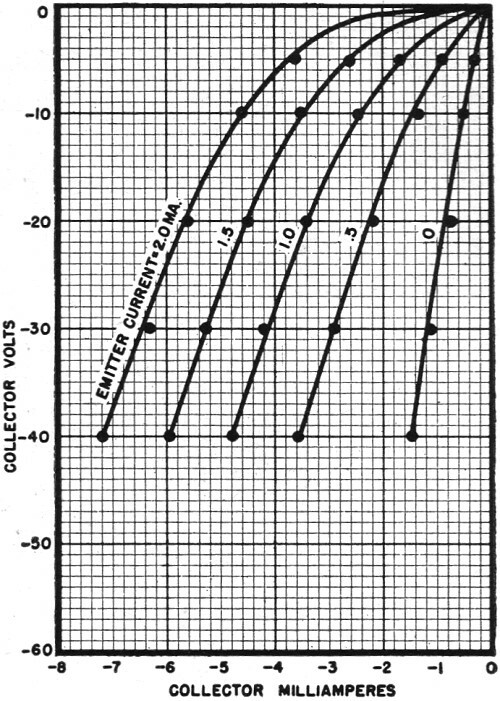 Oscillogram of output characteristics of RCA's "p-n-p" junction transistor. An appreciation of some of the most outstanding qualities of the junction transistor may be obtained from a study of the output characteristics given in Fig. 9. 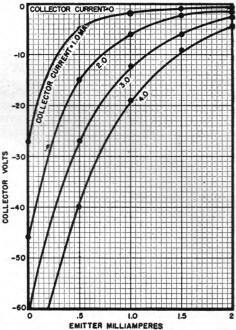 This family of curves indicates that the junction transistor has a constant current amplification factor and output resistance down to very low collector voltages. Operation with power inputs as low as 0.6 microwatt have been reported. This input is about one-ten-thousandth the power dissipation required to operate the point-contact transistor, and les than one-millionth the power required to heat the cathode of most vacuum tubes. The almost ideal static characteristics show that the junction transistor can operate close to 50 per-cent efficiency as a class A amplifier. Although the junction transistors for which these characteristics are plotted can operate at only limited power dissipations, approximately 50 milliwatts, design of these devices for operation at 2 watts or greater is possible. Table 1. Average values of several characteristics for two types of transistors.